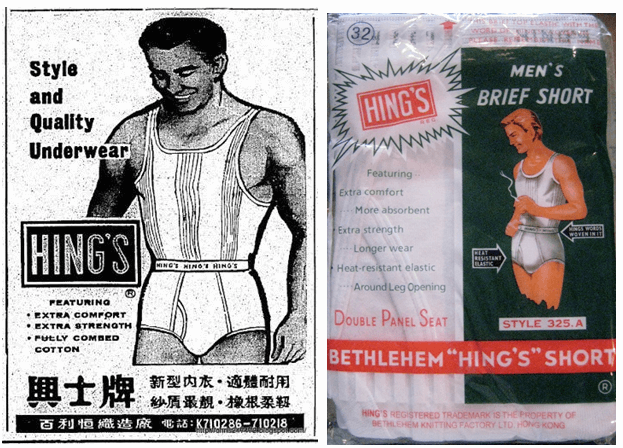 From the 1950s to the 1970s, Hing’s was a popular local brand of cotton underwear manufactured by Bethlehem Knitting Factory. Founded in 1950 by C.T. Shiu (邵之道), the firm moved into its current location at 483 Castle Peak Road in Cheung Sha Wan in 1961. Aside from the local market, Hing’s underwear were also exported to Southeast Asia in markets such as Singapore and Malaysia in the 1960s. By its 20th anniversary in 1970, the firm had 400 workers. In addition to underwear, the firm also made T-shirts. The next year, the firm was incorporated. From the beginning, Bethlehem focused on product quality rather than low prices. In 1975, Bethlehem acquired new machines which made its undershirts shrink-resistant. The new and improved line of underwear were sold with the “Shringaniz” trademark. At the time, the factory occupied five floors totaling 30,000 sq ft and employed 250 workers. 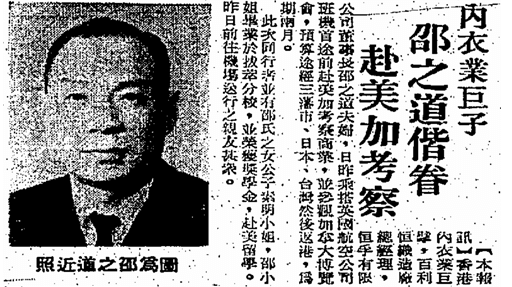 In the 1970s, CT Shiu’s son Alan Siu Kwok-wei (邵國維) who was graduated from UC Berkeley and Stanford joined the family business and became executive director of Bethlehem. The firm is still alive although it appear to have shifted its focus to the overseas markets such as Indonesia. This article was first posted on 6th November 2017.